Great Walk number 4! I’ve been looking forward to this since a year ago when Alana and I walked a section of it. This time Allen and I came back to hike the entire coastal track: 60 kilometres over 4 days. 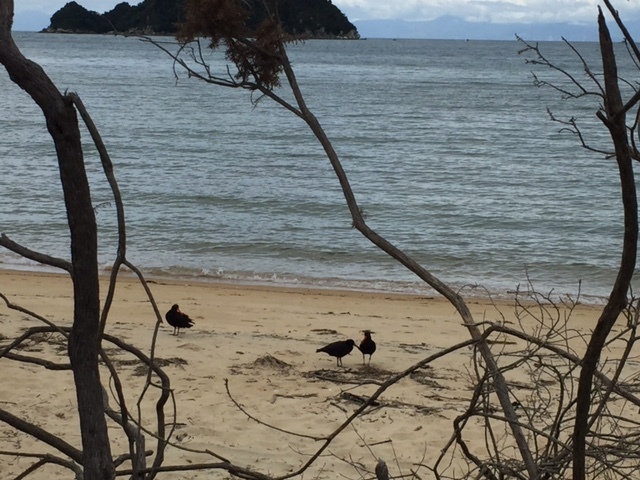 On Friday afternoon we caught the regional flight from Auckland to Nelson; picked up our rental car and winded our way to Marahau, the entrance to Abel Tasman National Park. After a few administrative tasks – collecting Monday’s water taxi tickets & organising long-term parking – we started the day’s walk at 6pm. We were cutting it close with 12.4km to walk before dusk; the upside was that we had the trail nearly to ourselves. It took 3.5 hours to reach Anchorage Hut just before dark. Using our torches we managed to find two bunks in the same room. Day 2 was the longest section: 25km from Anchorage Hut to Awaroa Hut. We left at 8am and cut out 5km by timing our walk with low tide. The first few kilometers we walked barefoot through a mud flat. 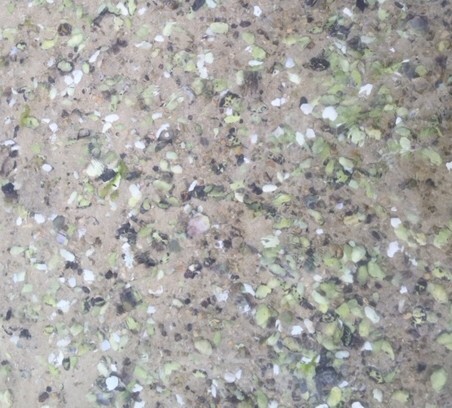 We waded through tidal pools and tried to avoid stepping on millions of tiny mud crabs. Torrent Bay was a great spot for morning tea. A few locals were congregated on the beach and I was tempted to ask for a hot coffee. When the land was turned into a national park the individuals who owned land were allowed to keep it. As a result there are private homes, a resort and even small neighbourhoods in the park. Leaving Torrent Bay we put our shoes on for the first time that day and ascended into the bush. A couple hours later we descended onto another beach, Bark Bay, for lunch. We had to hustle to take advantage of low tide so couldn’t linger or go for a swim. Several hours later we reached Awaroa Lodge, a resort within the park. I only found out about this place a couple days ago so we were not spending the night, but I did secure a dinner reservation. Before dinner we hung out in their library, reading while sipping coffee and beer; a luxury during a Great Walk. Dinner was delicious, though any hot meal would have been appreciated. After that we walked the final 30 minutes to Awaroa Hut which can only be reached at low tide. We left the hut at 8am Sunday and crossed Awaroa Inlet at low tide. We moved through the day at a gentle pace, reaching Totaranui by 10:30am. Totaranui is a sort of hub within the park. Because there is road access this is a popular campsite. There is a manned DOC information centre, a beautiful golden beach, and it is the northernmost point to catch the water taxi. We sat on the beach for a few hours, watching boats zoom in and out and day trippers climbing aboard the larger ferries. The water was perfect for a dip after warming up in the sun. Shortly after noon we continued our trek north. 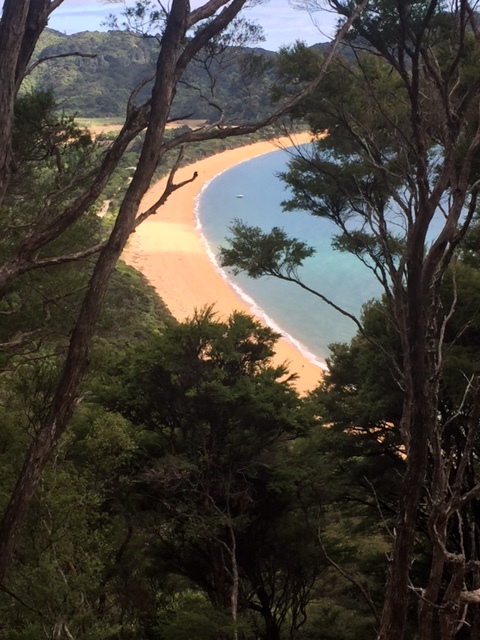 The next 10k was a series of steep ascents, beautiful views of the Marlborough Sounds, and sharp descents to golden beaches: Anapai Bay, Mutton Cove, and finally Wharawharangi Bay. 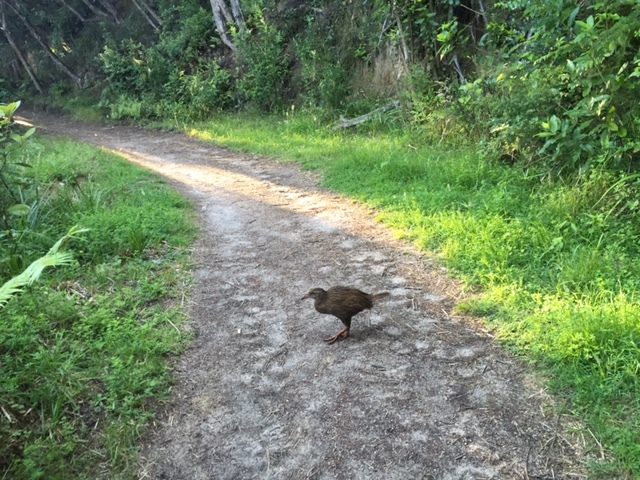 We saw the flightless weka as we approached Wharawharangi Hut well before nightfall. 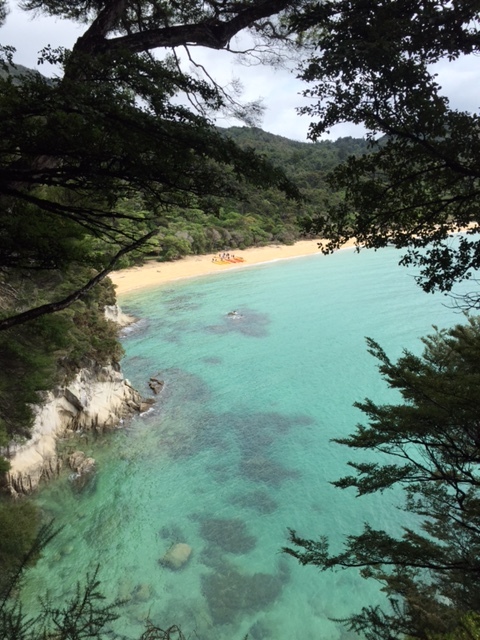 The Abel Tasman Coastal Track technically ends at Wainui car park, but we opted to cross back over to Totaranui and take the water taxi back to Marahau rather than the bus from Wainui. Instead of retracing our steps we walked the Coastal Track towards Wainui, then the Gibbs Hill Track across the peninsula. This was the most challenging part of the trek. My legs were fatigued and there were no built in pit stops like all the beautiful beaches over the past few days. The trail ascended to 400+ meters and then followed the mountain ridge until we descended back onto the beach. We reached Totaranui well before our 12:30 water taxi and I happily switched my blistered feet into flipflops. We caught an earlier taxi back to Marahau, covering the distance in an hour and passing the bays and beaches we’d enjoyed over the long weekend. Fur seals came out to wave us goodbye. This park has something for everyone. If you’re not keen to stay in DOC huts or carry your luggage, you can stay in Peppers Awaroa Lodge or have your bags delivered by water taxi. Alternately, you can stay in town and make it a day trip, just walking a section of the trail or enjoying the beaches. We also could have kayaked part of the trek instead of walking. So many options!